Remember that old saying that big things come in small packages? Well, that definitely applies to Eagles’ Markus Wheaton. He didn’t have the massive body that most teams look out for when selecting a player, but he did have that raw speed, good hands and solid route-running that made him a major target during the 2013 NFL Draft. This and many other reasons was why the Pittsburgh Steelers selected him as the 79th overall pick in the 3rd round of the 2013 NFL Draft. He had the same height shortcomings as Donnel Pumphrey. Before starting off his professional career with the Pittsburgh Steelers in 2013, Markus, who is skilled as both a Wide Reciever and a Kick Returner played college football at Oregon State University. He currently plays the WR and KT positions for the Philadelphia Eagles, but before sealing a one-year deal with the team in 2018, he had played for the Chicago Bears. Born Markus Levonte Wheaton on the 7th day of February 1991 in Phoenix, Arizona, the champ began playing football at Mountain Pointe High School, where he was a student from 2005 to 2007. As a junior, he made twenty-three receptions for 476 yards with 6 touchdowns and forty-nine tackles. He would later transfer to Chandler High School where he also played for the school’s football team, recording 37 receptions for 736 yards and 4 touchdowns. Markus Wheaton was a 3-time first-team all-region, as well as an honorable mention all-state selection. Rivals.com projected him a 3-star recruit and he was rated the No. 41 best athlete in the country. Markus didn’t only make a name in football at Chandler High School but also as a sprinter. He was in the school’s track team and won both the 400-meter dash and the 200- meters dash at the 2009 Chandler Invitationals with a time record of 47.38s and 21.42s respectively. He also participated in the 2009 5AI State Championships, running 100 meters with a season-best time of 10.81 seconds. During his senior year, he committed to Oregon State, where he began his college career in 2009. In his four-season college career, Markus Wheaton recorded a total of 227 receptions for 2,994 yards, with sixteen touchdowns. He also returned three kicks for a total of 81 yards and 3 punts for 68 yards. Just like in high school, Wheaton was on the Oregon State track team and represented the school at the Prelims of the 5A Fiesta Regional, where he recorded a career time of 46.80 seconds in the 400 meters. At the 2012 Oregon Twilight Meet, he finished second in the 100 meters race with a career-best time of 10.35 seconds. With the 79th overall pick in the 3rd round of the NFL Draft of 2013, the Pittsburgh Steelers got Marcus Wheaton to ink a 4-year deal worth $2.81 million with $591,000 guaranteed. His professional career debut was in a game against the Tennessee Titans and he would record his first career start a few weeks later in a game against Minnesota Vikings. He made three catches for twenty-six yards. He would later make a season-high of three receptions for 38 yards in a game against Detriot Lions. 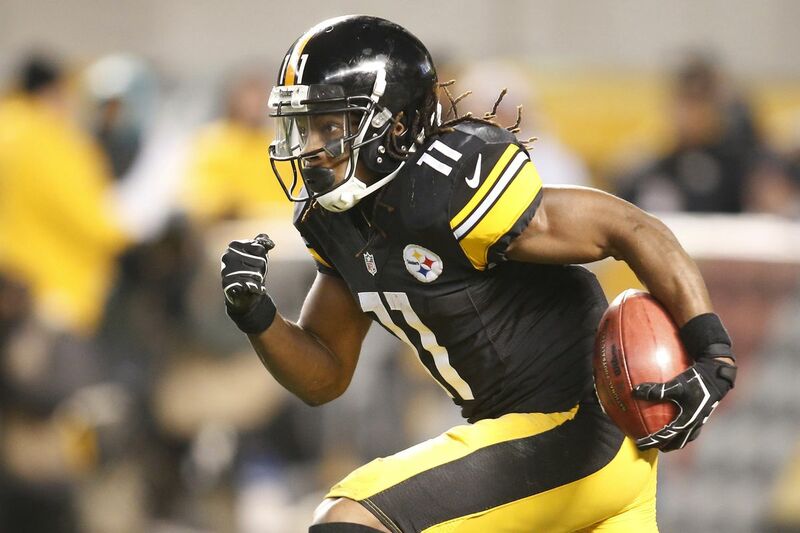 Markus Wheaton ended his rookie season with a total of six catches for sixty-four yards in twelve games and one start. With the team’s veteran WR Emmanuel Sanders moved to Denver Broncos in 2014, leaving Wheaton a larger space to fill in the offense, this notwithstanding, he ended the season with fifty-three receptions, two touchdowns in eleven games, 644 receiving yards, and sixteen games. With a total of forty-four receptions for 749 yards and five touchdowns, recorded in the 2015 season, Wheaton was named No. 10 among NFL wide receivers of the year. But due to a shoulder injury, he only played three games during the 2016 season with 2 starts and 4 catches for 51 yards. The 2016 season marked the end of his career with the Steelers until signed a 2-year contract with the Chicago Bears in 2017. The team released him the following year after he recorded only 3 receptions for 41 yards the entire year. In May 2018, the Philadelphia Eagles signed him on a one-year contract. Markus Wheaton is not the only child of his parents -Odis and Katrina Wheaton. He has an older brother named Marquese Wheaton, who played the defensive back position at the Southern Mississippi University and is currently with the Tampa Bay Buccaneers as a cornerback. Wheaton’s father played basketball at Howard Payne University and his cousin Kenny Wheaton is a former NFL player who played the defensive back position for the Dallas Cowboys. The Eagle stands at a height of 5 ft 11 in (1.80 m), weighing 86kg (189 lb). His arm length is 32 3/4 inches and his hand size is 9 1/8 inches.